In a time of turmoil, one woman will search for love and peace--and find it where she never expected. Tugged this way and that by fate's indifferent hand, Claudia's life is adrift--until she meets Lucius Pontius Pilate and becomes his wife. When they move to the troublesome territory of Judea, she does what she has always done: makes the best of it. But unrest is brewing and Claudia will soon find herself and her beloved husband embroiled in controversy and rebellion. Might she find hope in the mysterious Jewish Rabbi everyone seems to be talking about? Let this epic story whisk you through marbled palaces, dusty marketplaces, and idyllic Italian villas as you follow the unlikely path of a woman who warrants only a passing mention in one of the Gospel accounts, but whose story, as told by Diana Wallis Taylor, is one worthy of legend. I quite enjoyed Claudia. It is good, well-researched historical fiction that opens an interesting window on a mysterious woman mentioned in the Bible. I always wondered what happened to Pontius Pilate's wife. Now I have a feel for what it might have been like. I enjoyed the Roman setting and the Jewish customs in the story and I loved the fact that it doesn't sugarcoat anything. It is a beautiful story, not at all gritty and with next to no graphic content and yet it's sort of bittersweet. Life is complicated, nobody's perfect, and happy endings don't always happen. Claudia is a lovely story nonetheless. 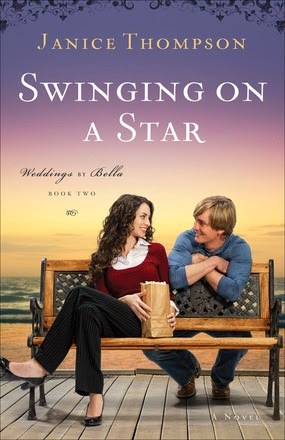 Janice Thompson's Fools Rush In was the sweetest and most hilarious Christian fiction I had read in a while, so I had high hopes for the sequel, Swinging on a Star. It did not disappoint. There's a fine line between ambitious and crazy. Bella's just not sure where it is. Bella Rossi's life is nearing perfection. Not only does she have the perfect guy, but she's also running a successful wedding-planning business and is about to plan its most ambitious wedding yet--a Renaissance-themed fairy tale come true, complete with period costumes and foods, horse-drawn carriages, and even a castle. There's only one hitch. The best man just happens to be Hollywood's hottest and most eligible bachelor, and he's showing an interest in Bella. Oh, and did we mention he's staying at her house to avoid the paparazzi? You know those chick flicks where improbable happening is piled on improbable happening, where everything almost goes horribly wrong but ends up fantastically right and where every character is loveable and crazy? That's what Swinging on a Star was like. Highly recommended for a sweet and hilarious evening's reading. I'll give it to Julianna Deering that I didn't guess who did it until the end. As a matter of fact, it shocked me. It was plausible, but it didn't seem thematically right. But then, I don't suppose people have any consideration for themes when they choose to be murderers... Actually, I take that one back. This murderer was very interested in themes and such. The quotations from Shakespeare pinned to the body was a nice touch, even if rather morbid. What irritated me, though (and it's in most Christian fiction, so it's not fair to blame it all on Julianna Deering) is Madeline's (Drew's girlfriend) silly hesitation about whether she loved Drew and wanted to get married or not. In the last book it was clear they loved each other. In this book, they spend most of their time kissing and trying to keep it from going too far. One (at least someone portrayed as the perfect Christian girl like Madeline was) does not simply go around kissing someone like that and wonder whether one actually loves him or not! The hesitation-about-marriage theme can be done well, but it takes a lot of characterization. This simply felt like a plot device to add some tension to the romantic angle. But there were some beautiful passages in Death by the Book. I guess it's that when you see ability in an author you hold her up to a higher standard which then she doesn't always measure up to. 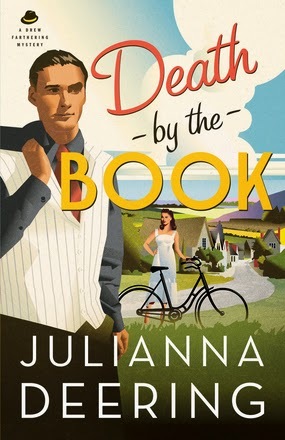 But Death by the Book was an enjoyable read, for all that. And it's still head-and-shoulders above many Christian fiction novels. Disclaimer: Book has been provided courtesy of Baker Publishing Group and Graf-Martin Communications, Inc.
Do you desperately fear you have nothing to offer the world but secretly hope you're wrong? You were born to make art. You were made to live art. You might not see yourself as an artist, but you are--in so many unexpected ways. In what you create, whether poetry or pie, sculpture or sand castle, calligraphy or conversation. It's time to uncover the shape of your soul, turn down the voice of the inner critic, and move into the world with the courage to be who you most deeply are. Creating a life of meaning is not about finding that one great thing you were made to do, it's about knowing the one great God you were made to glorify--in a million little ways. In this book, Emily Freeman says many things I've been thinking through but have never yet found in one single book. She leads her readers on a journey into discovering themselves as God's artwork who also make art. This book is one of the best I have come across for explaining the worldview of the Christian artist. Much of A Million Little Ways is directed to the non-creative people who don't see themselves as artists. This was a little boring for me, but the parts I needed to hear far outweighed the parts that didn't apply to me. Emily's writing comes across as 'artistically modern' (tense changes, lots of adjectives, strangely written sentences, etc) which some readers will love and some might be confused by. I confess I didn't enjoy the writing style as much as I thought I would, which is the only reason why I'm not giving this book a 10. 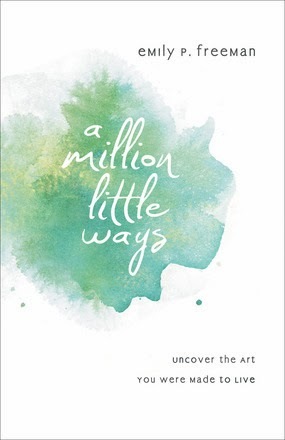 A Million Little Ways is highly recommended both for creative Christians and those who would like to be more creative. Available at your favourite bookseller from Revell, a division of Baker Publishing Group. It's too easy for us in the west to forget about the rapidly growing but persecuted church in China. 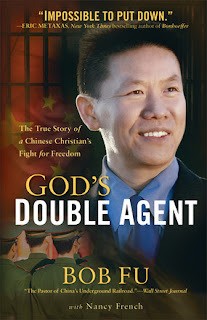 The story of Bob Fu's childhood, his conversion to Christianity, his romance with his wife Heidi, his work as a preacher, his imprisonment, and his escape from China provides a wealth of fascinating information about Chinese culture, Communism, and the role of Christians in a hostile nation. But more than that, it's interesting! God's Double Agent is an intensely readable story that captured my attention better than many novels do. Recommended for any Christian, particularly those wanting to know more about Chinese culture and persecution. Available at your favourite bookseller from BakerBooks, a division of Baker Publishing Group"
Hi! I'm Maria Elisabeth, but friends just call me Maria or Maribeth. Jesus Christ is my heart song and I love looking for the true, the good, and the beautiful, especially in literature and music. Welcome to my blog and I hope you stay a while. I'd love to get to know you! I am not a photographer, so all images on this blog are from either google or pinterest unless otherwise stated. I try not to infringe on copyright, but if you own an image on my blog and would like it off, tell me and I'll remove it right away! Thank you.